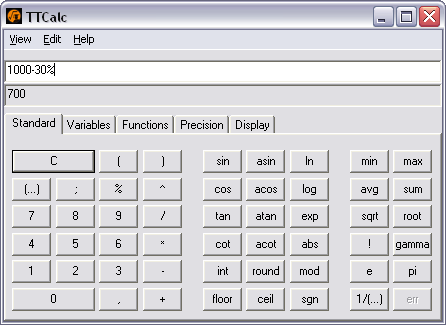 TTCalc is an open source bignum mathematical calculator. TTCalc features arithmetical functions, trigonometric functions, inverse trigonometric functions, hyperbolic functions, inverse hyperbolic functions, logical operators, logarithms, functions for converting between degrees and radians and so on. Additionally the program allows a user to define his own variables and functions. TTCalc possesses an easy to use interface. TTCalc possesses an easy to use interface. Calculations are performed by using binary floating point numbers with three kinds of precision, the biggest has 1024 bits for its mantissa and 128 bits for its exponent that is about 9.805180 * 10^51217599719369681875006054625051616657 with 306 valid decimal digits. TTCalc independently allows to insert and display values with the base (radix) from two to sixteen. Convenient Fitness Calculators for home use. Calculate your BMI, body fat etc. Qweas is providing links to TTCalc 0.9.3 as a courtesy, and makes no representations regarding TTCalc or any other applications or any information related thereto. Any questions, complaints or claims regarding this application TTCalc 0.9.3 must be directed to the appropriate software vendor. You may click the publisher link of TTCalc on the top of this page to get more details about the vendor.